Kristen was finally released from the hospital on Sunday morning. We celebrated by going to lunch at her favorite sushi restaurant (eating sushi while pregnant is not advised). While she is still quite sore from the c-section, Kristen is recovering well and has weaned herself from the more powerful painkillers. She spends a lot of time breastfeeding her Pump-in-Style and so that we can bring Carson some mother's milk in the NICU. Carson has been in the NICU (neonatal intensive care unit) at Children's Healthcare of Atlanta since just after birth and has continued to progress nicely. Originally he looked a bit like a science experiment with an IV line for fluids and nutrition, a tube into his lungs to breathe for him, a tube into his stomach to remove bile, three skin-mounted sensors for heartbeat, temperature, and who knows what, a pulse-ox sensor on his foot which measured the amount of oxygen getting into his bloodstream, a blood pressure cuff, two lines attached to his umbilical cord for blood draws and secondary blood pressure monitoring, and a urinary catheter. He now has only the skin sensors, the pulse-ox, an external nose-mounted oxygen line, and a feeding tube. He has been able to take up to 65ml of breast milk through his feeding tube and keep it down so they are hoping to remove the tube and try bottled breastmilk later today. That is a huge step in the right direction if he takes well to the bottle. We also know that he has been able to maintain the necessary oxygen level in his blood even without the oxygen line (for short durations) but they are keeping that on just as a precaution for now. He is still on sedation but only on an as-needed basis (not a continual drip). Our only significant concern at the moment is that we have yet to hear him cry. He gets upset and tries to cry but we haven't heard his voice yet. Obviously, his trachea and larnyx are still healing so we remain optimistic. Kristen and I are visiting Carson everyday at the NICU until he comes home. We don't have any estimate from the doctors yet, but I have my money on Carson being home by Saturday. It's late friday night and Kristen is asleep in her hospital bed as I type this. We have been living in a hospital room together since Tuesday morning and we are both anxious to get home to be with our other son, Evan. Kristen has been weaned from the epidural and is managing her pain with percocet (sp?) and Motrin. She is hoping to be released sometime Sunday. While we are anxious to get home, I must admit that we have enjoyed being this close to Carson (his hospital is directly across the street). I've been over there three times today alone. Carson's health continues to improve daily. He is still on a breathing tube because his lungs haven't developed completely yet. Because of this he remains under sedation so we really don't get to interact with him much. However, tonight for the first time we actually saw him open his eyes for just a moment. I could swear that he smiled when he saw his mother for the first time. The respiratory therapist has given Carson a surfactant and some steroids to accelerate his lung development with hopes of removing the breathing tube on Saturday. No word yet on when he might be released, but I'll post an update as soon as we know. Carson is 80 hours old now. May he never have any as difficult as his first five. It's strange how much your life can change in the course of a day. This morning we were prepared to face the reality that our son was going to be born with a very serious birth defect which may require multiple surgeries to correct including the possibility that a section of his colon might be used as an esophagus. Kristen was induced around 6am this morning and we had hoped that Kristen would push little Carson out around noon. However, when Dr Bodner came in to assess her progress at about 3:30 Carson still hadn't dropped down far enough and his heart rate was unstable so an emergency C-section was called. I have never been in an operating room and was floored by the number of doctors and nurses in this tiny operating room. There were 12-14 people in the room all working in concert... simply amazing. I was sitting up near Kristen's head and holding her hand, but there was a blue curtain which shielded our view. Kristen was fully conscious the entire time. When the doctor finally pulled Carson from the womb he was extremely pale, his heartrate was about 80, and he was not breathing. We kept waiting to hear him cry out, but of course, he couldn't. It's an eerie feeling in an O.R. when things go wrong. The tone of people's voices and the look on their faces made it abundantly clear that things were dire. The anesthesiologist actually bent over and offered to put Kristen under sedation and said that I could go to the waiting room if this was too intense for us. We both declined. Kristen and I could hear the team repeatedly attempting to get a breathing tube in him, but with no success. We heard one of the doctors ask for two different dosages of "epi" to be drawn up (not a good sign) and another was discussing the possibility of a tracheotomy. Finally, we heard his heart rate increase and the team had been able to breathe for Carson using a bag so his blood was now getting the necessary oxygen and was flowing to where it was needed. His color turned pink and we felt a small sigh of relief. They let us spend about 3 minutes with him before whisking him away for evaluation. (see picture below... that's me in scrubs on the left). After Kristen went to surgery recovery I rode with Carson in the ambulance over to Children's Hospital of Altanta where the team of doctors and surgeons would re-evaluate Carson's condition. However, we had been told that they had finally been successful in passing a very small air tube into his trachea (which is a very positive sign). When we arrived at the Children's Hospital they took Carson to the O.R. and told me to sit tight in the waiting room and wait for their call. Slowly, the good news started to leak in. First, Carson did NOT have esophageal atrisia as previously diagnosed. It was a problem with his larynx. Next we learned that there was a cyst on the trachea just above his larynx (not actually on it). Finally, we learned that both his trachea and his esophagus are fully formed! They actually drained the cyst right when they found it and Carson did great through the procedure. The last doctor I saw was Dr Gower who said to me "I want you to buy a lottery ticket for me on your way home tonight. " Apparently, of all the possible conditions which could have caused these symptoms, this was (by far) the best possible case scenario. They moved him to the NICU shortly after surgery and I got to spend about 30-40 minutes with him before returning back to Northside to be with Kristen. The staff at both Northside & Childrens were amazing. Not only did they provide outstanding care for both Kristen and Carson, they really went out of their way to explain everything that was going on and were extremely nice. Apparently, news of Carson's condition had spread throughout the labor & delivery staff and Kristen said that one of the nurses from the O.R. came to her recovery room and actually began to cry when Kristen told her how well Carson was doing. My sincerest thanks to the entire staff of 20+ people who helped us through this. Also, thanks to my parents for being here not only today, but for the past six weeks while Kristen has been on bedrest. I have no idea how we could have done this without you. It's been an amazing day for us... certainly one we will never forget. You can click on any picture to see it fullsize. Today at 4:35pm Kristen gave birth via c-section. Unfortunately, Carson was not breathing and had a very weak heart rate at birth. They were just about to poke a hole in his throat when they finally got a small airtube passed into him. 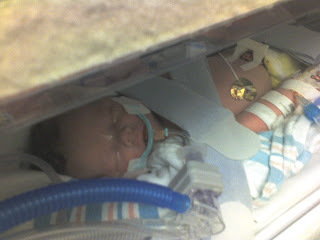 His heart rate is now fine, and he is breathing with the tube. But we are not sure what lies ahead for him. Apparently he does NOT have AE/TEF but rather something is wrong with his larynx (voicebox). I am about to consult with a surgeon now and we expect that Carson will be in surgery within 30 minutes. I've added a little gadget on this blog that will provides real-time updates of Kristen's progress (just look to the box on the right). These updates can be done via my mobile phone which will be a bit easier to do as we get closer. If you are curious, the real-time update uses a technology called Twitter. Another doctor's appointment today and the decision has been made to admit Kristen to the hospital on Tuesday (5/20) and drain off some of the excess amniotic fluid before inducing labor early Wednesday morning. Surgery to repair the AE/TEF will be scheduled to happen within 24 hours of birth. I cannot believe that we are only a week away! Yikes! I just realized that I had never posted the update to Kristen's hospital stay. Sorry to keep everyone in suspense. Kristen was released later that evening and she has been taking it easy on the couch ever since.